It’s a buyers market today in Macalester-Groveland. 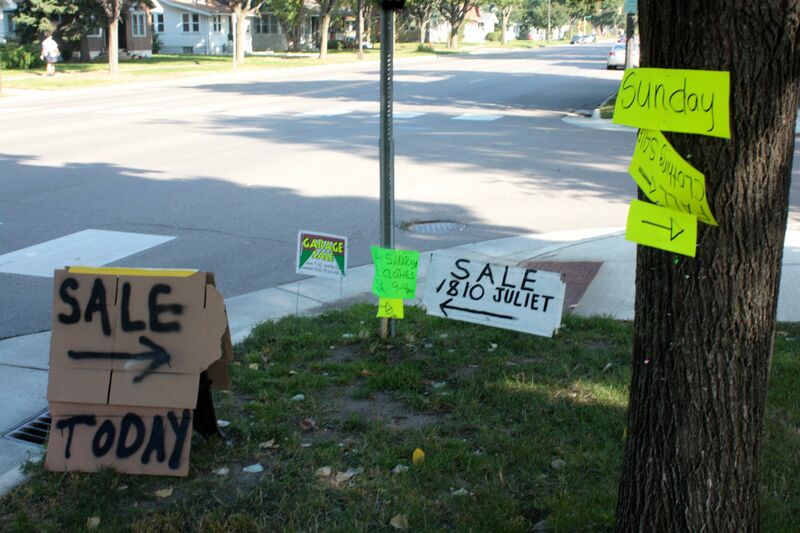 There are sales galore in Mac-Groveland on this beautiful Saturday. 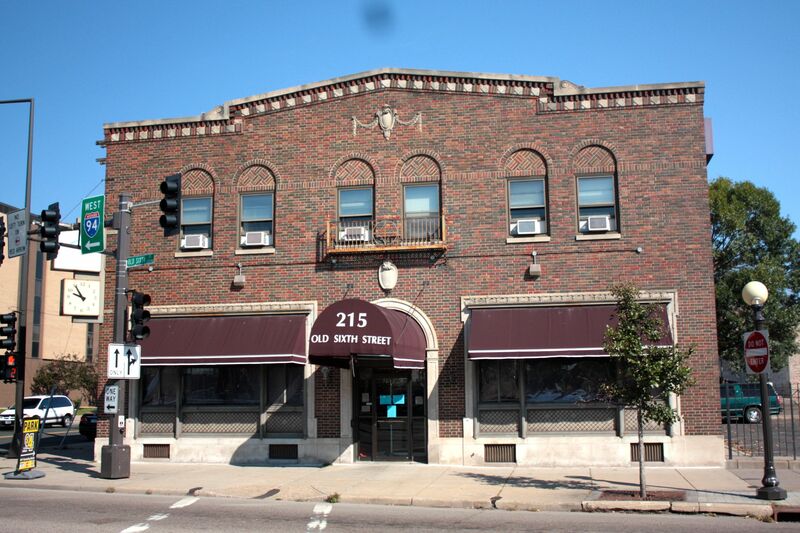 I made two stops on the same block of Palace Avenue in Mac-Groveland today, both for ornamentation so unusual they could (and may still) be recognized on the “Quirky Saint Paul” page of this blog. 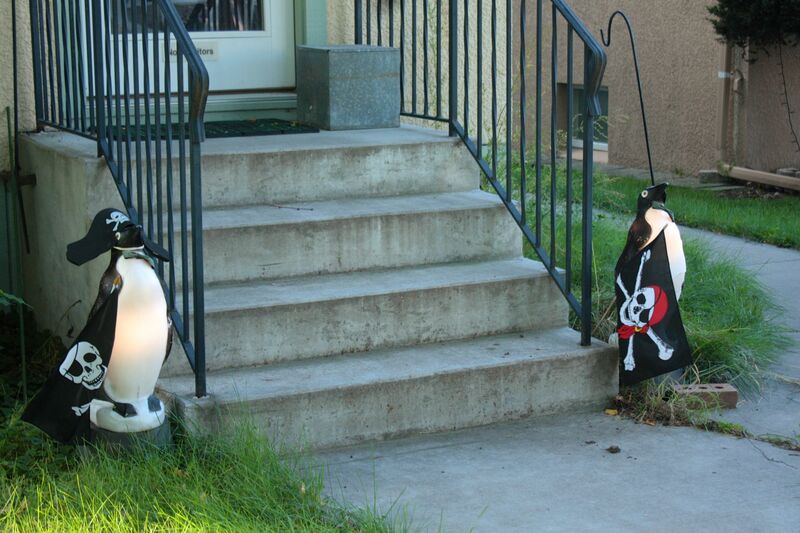 First, at 1366 Palace, these two pirate penguins stand guard. 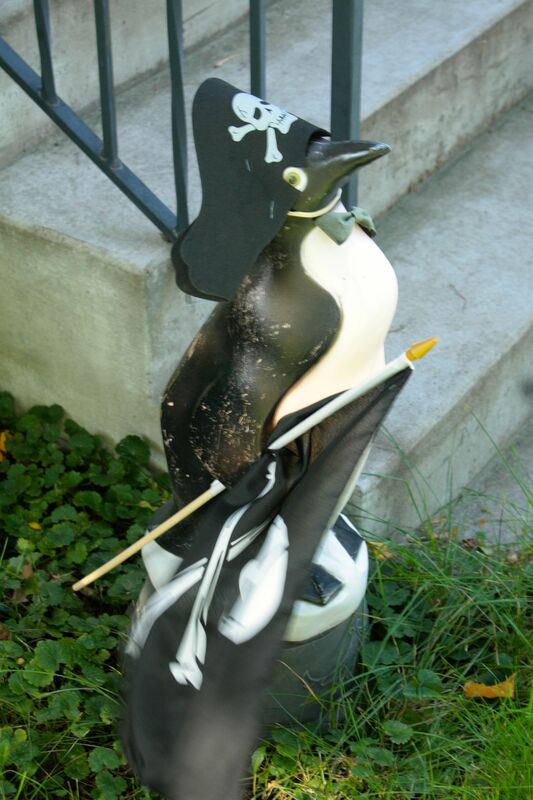 Pirate penguins or penguin pirates? You tell me. Then on the boulevard of 1360 Palace, a tree home for a small mammal or elf. 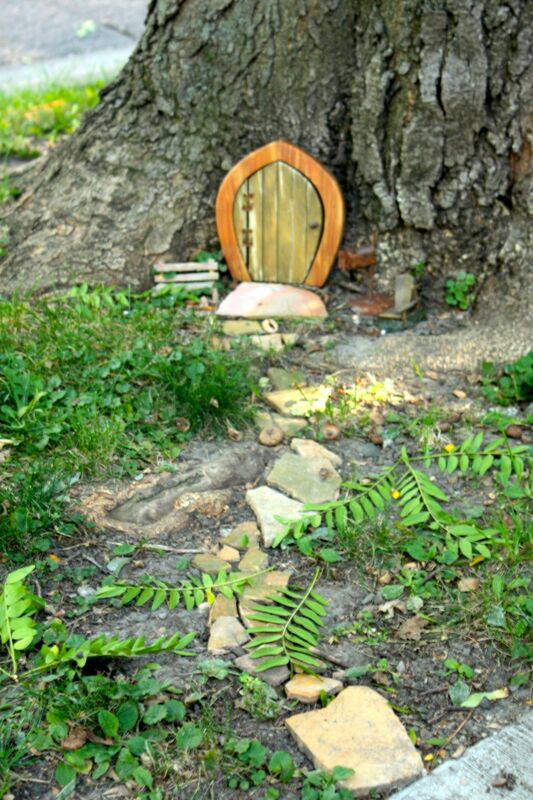 Could this be the home of the famous Keebler® elves? 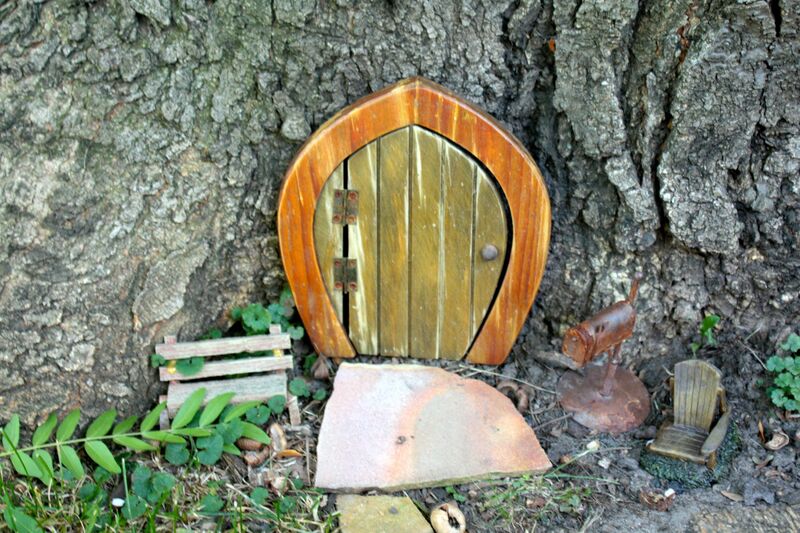 There’s even lawn furniture and a mailbox for the occupants. 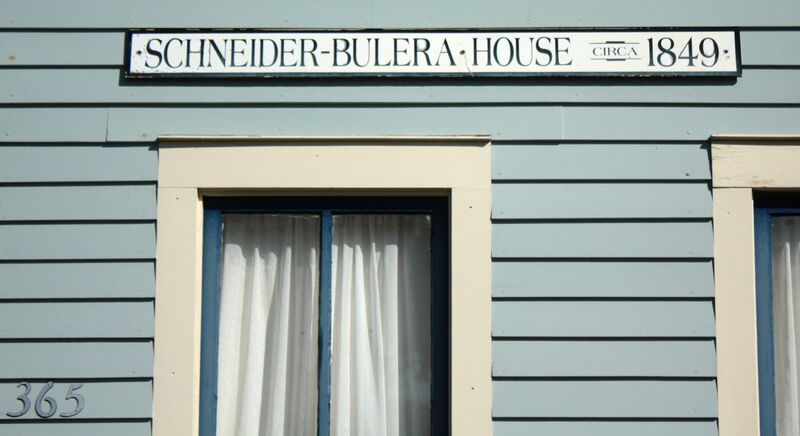 Today the Schneider-Bulera House is back in “like new” condition. Fast forward to the West End and the historic Schneider-Bulera House at 365 Michigan Street. There is a sizable amount of debate about the history of the Schneider-Bulera House, with most of the disagreement about the home’s age. 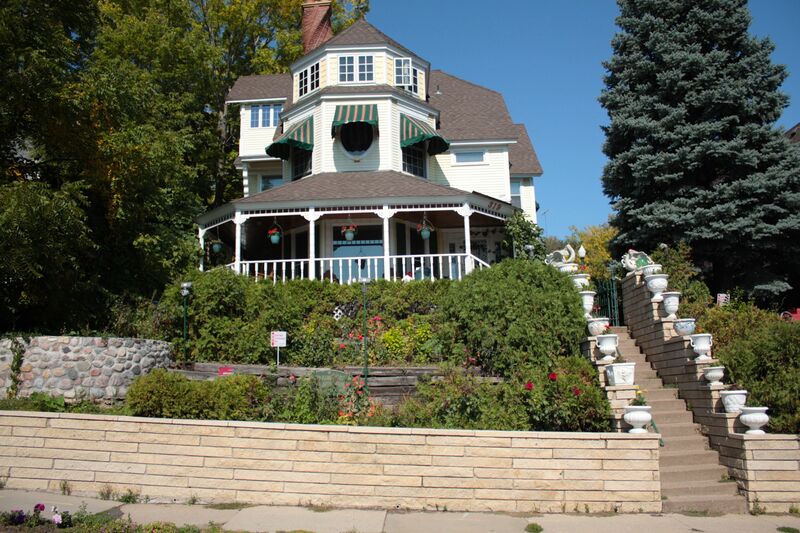 At one time local historians thought it could be the oldest surviving residential dwelling in Saint Paul but additional research changed that. 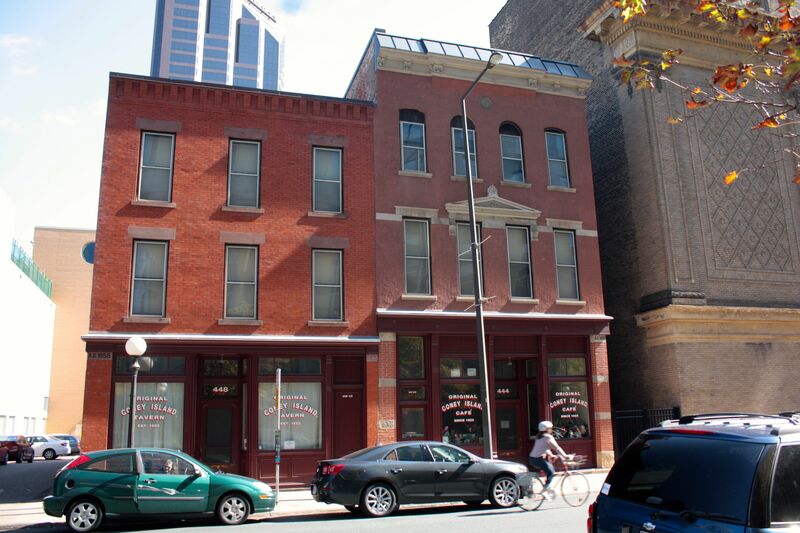 Now, prevailing opinion is that it is one of Saint Paul’s older homes. The Ramsey County Tax and Property look-up website gives an 1865 construction date for the house, with which the owner obviously disagrees. I haven’t dug up the full story but the Schneider-Bulera House fell into disrepair and prior to the most recent improvements, was in sad condition. This part of the West End, officially called Winslow’s Addition, has quite a number of older homes, most dating back to 1880 or later. Only 369 Michigan, immediately west of the Schneider-Bulera House, comes close to the same age. 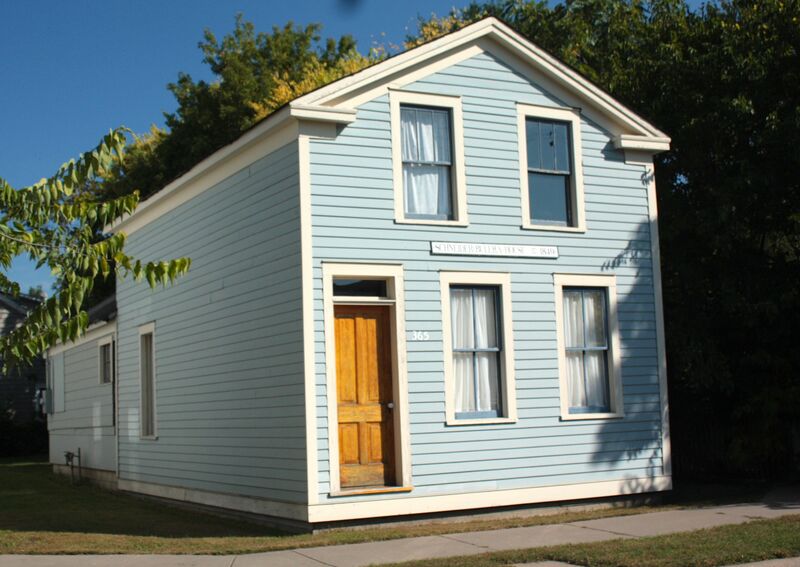 Again, according to Ramsey County records, 1870 is the construction date of 369 Michigan. 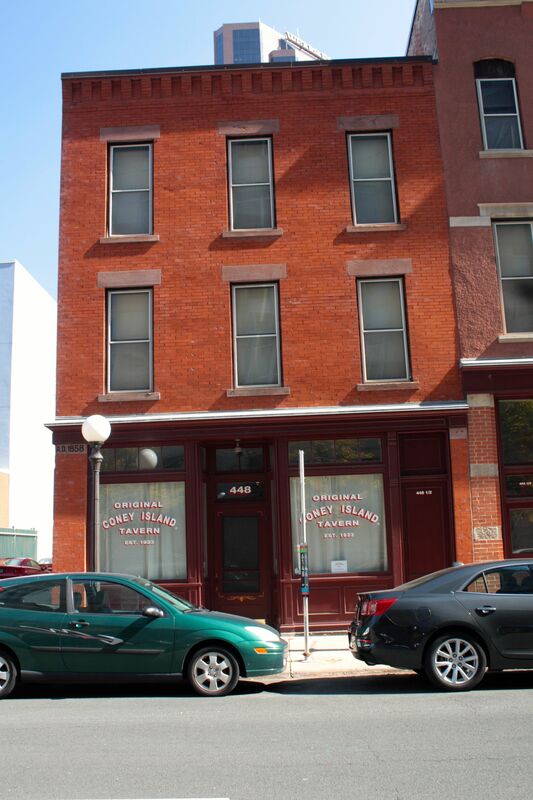 This brick home at 343 Michigan Avenue has been here for an estimated 135 years. 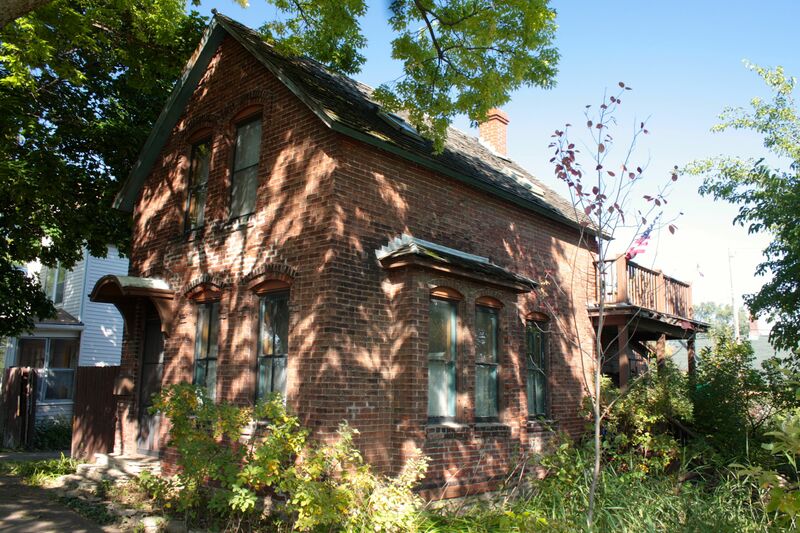 Several doors to the east is this brick house, built in 1880. Quite obviously the difference in style and construction material between this home and the Schneider-Bulera House is significant. No longer a single family home, the tree-shrouded 343 Michigan Avenue is the Hmong Archives, a collection of close to 111,000 artifacts. 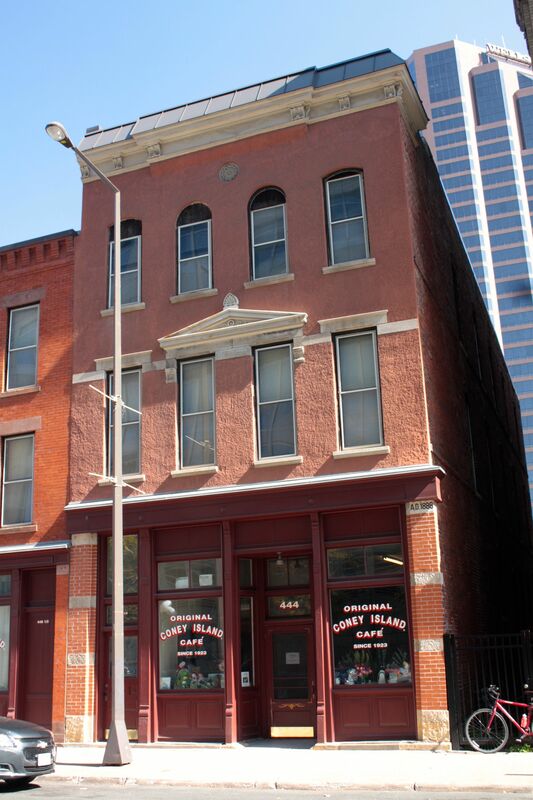 (2) Yuepheng Xiong founded the Hmong archives in 1999 and moved it to 343 Michigan in 2010. 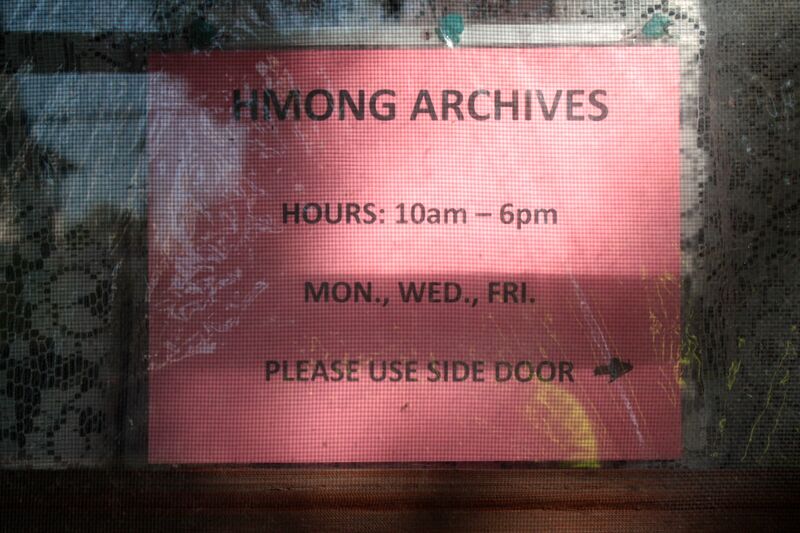 The Hmong Archives is open to the public both during regularly scheduled hours and by appointment. You might want to call before you go to the archives. I stopped three times and never found it open. 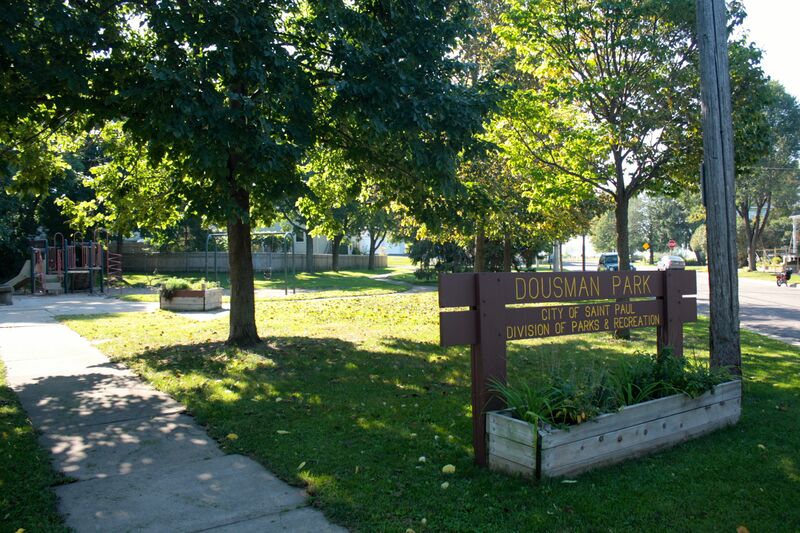 Dousman Park is a half-acre space at Dousman and Goodhue Streets with a small playground. 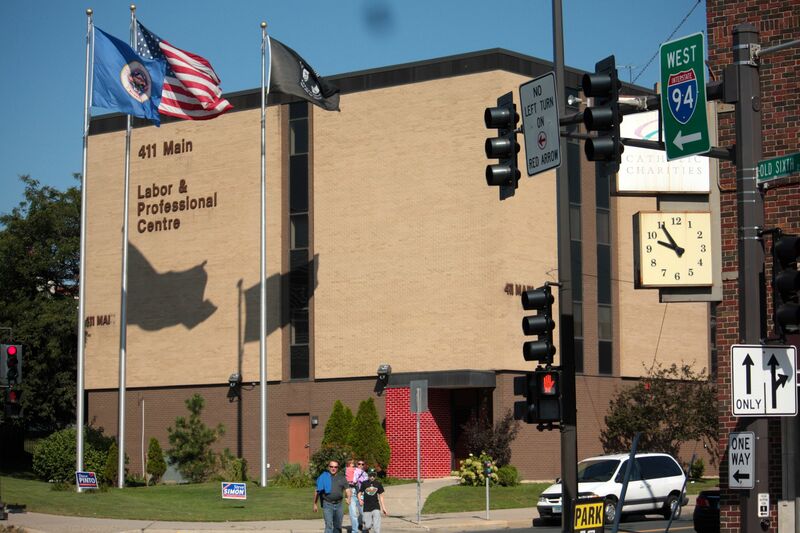 It’s less than a mile from Dousman Park on the West End to West 7th Street and Kellogg Boulevard Downtown. From there, the layout of some Downtown streets range from puzzling to confounding to mystifying, depending upon your experience and need to find an address. West 7th Street intersects West 6th, Old 6th and West 5th. North is at the top of the map. Courtesy google. 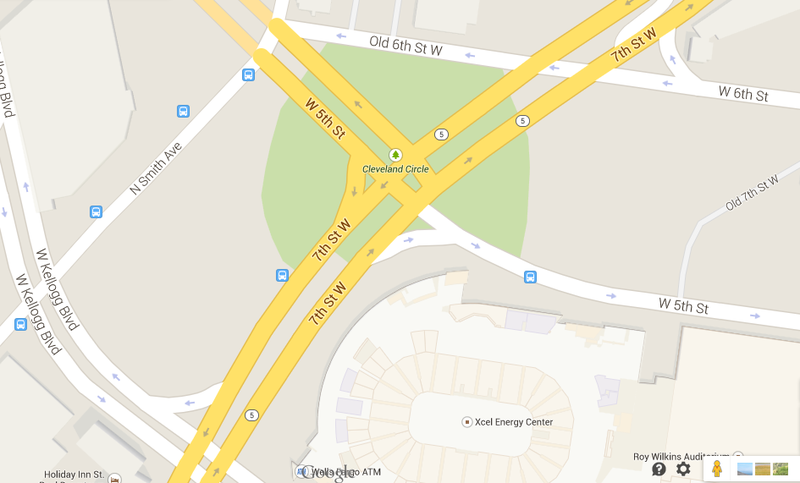 For instance, West 7th crosses Kellogg, then West 5th, and West 6th/Old West 6th Streets. One of several Catholic Charities buildings in this part of Downtown is at the corner of Old 6th Street and Main Street. 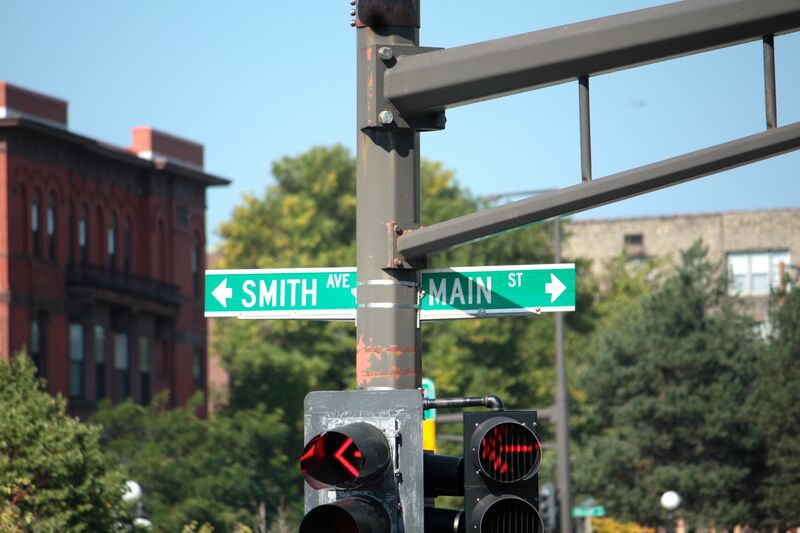 To blur matters more, south of this intersection Main Street becomes Smith Avenue. Main Street isn’t. And not even close. This picture is looking north from Old 6th Street and Main. The white object at the far end of Main Street is a “decorative” wall for the I-35E/I-94 commons. 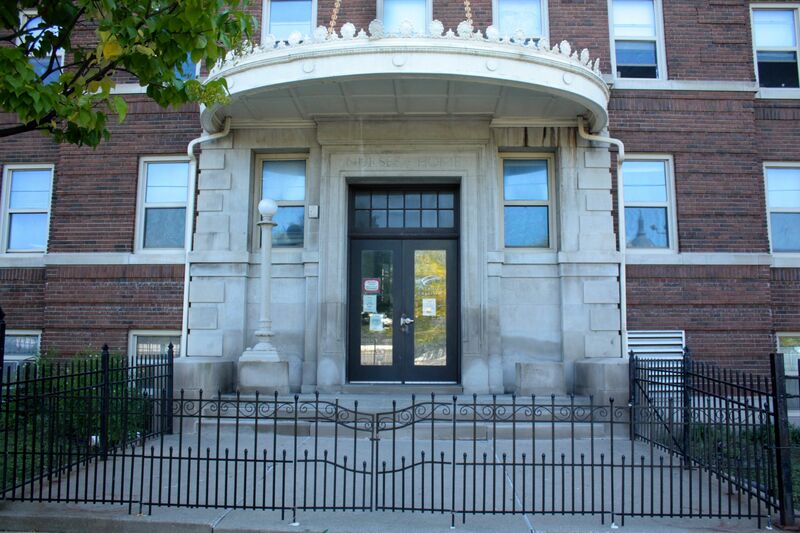 Mary Hall, a Catholic Charities’ shelter for the homeless. 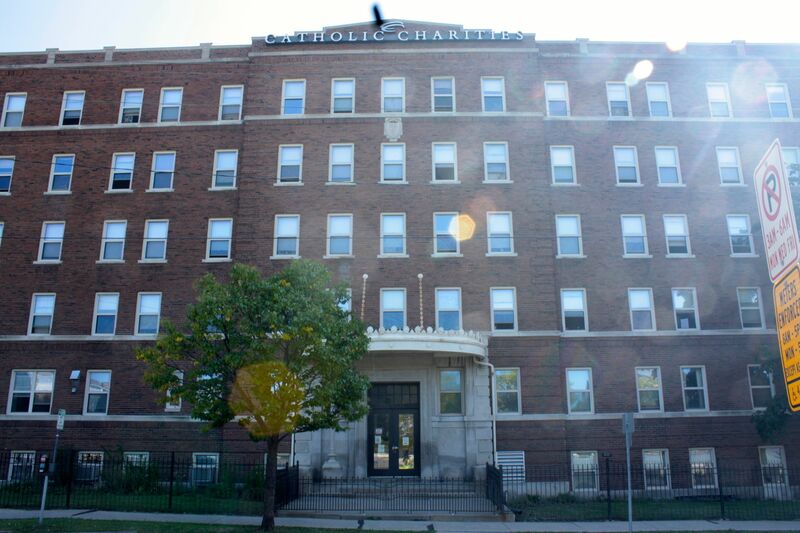 Catholic Charities owns and operates Mary Hall, a homeless shelter for adults. 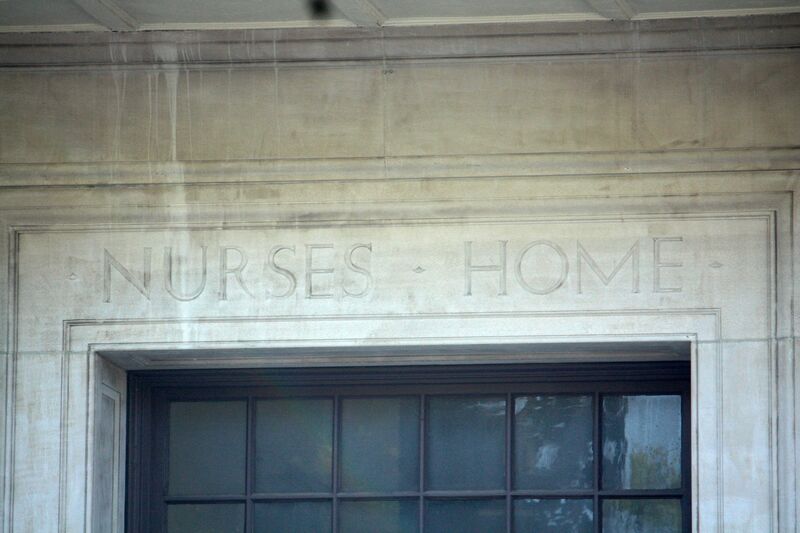 Built in 1925 or ’26 by St. Joseph’s Hospital, it offered, “a private room and ample accommodations” for more than 200 of its nursing students. Nurses gathered outside their dorm in 1953. Look at those hats! Photo courtesy Minnesota Historical Society. Today the entrance looks much the same. The one reminder I found of Mary Hall’s original use is above the main entrance. 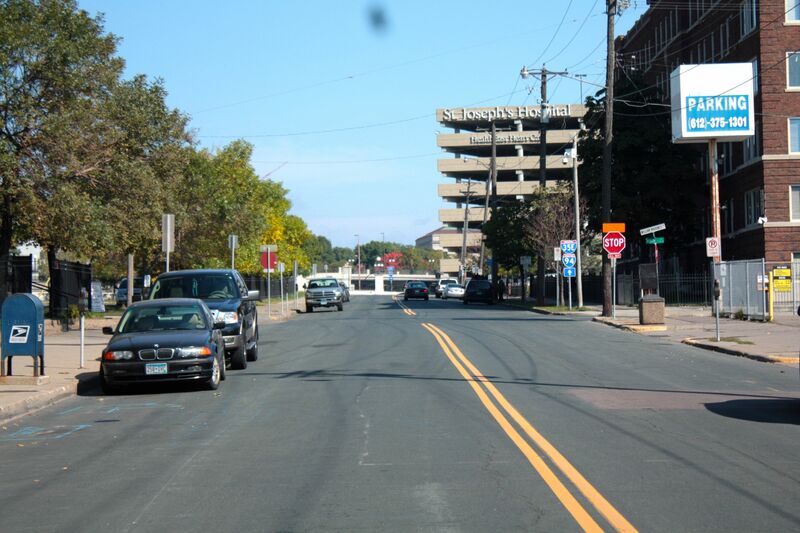 Continuing northbound on Main Street I waded through the St. Joseph’s Hospital campus. 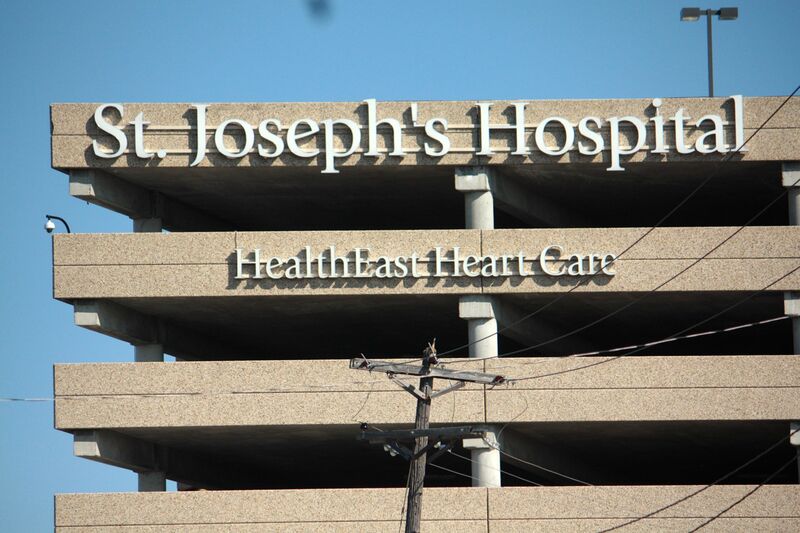 St. Joe’s parking ramp doubles as a billboard for the hospital. Now in the midst of the St. Joe’s Hospital campus at 10th Street at Main and looking east. 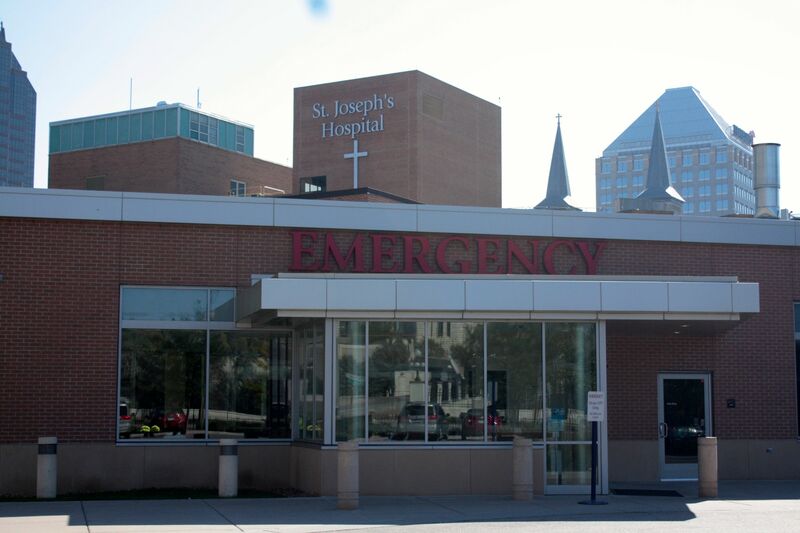 The emergency room is in the foreground, the twin spires in the background belong to Assumption Church and behind it, Travelers Insurance headquarters. From 10th Street I turned south on to St. Peter Street and caught site of the 20-story Gallery Tower building. 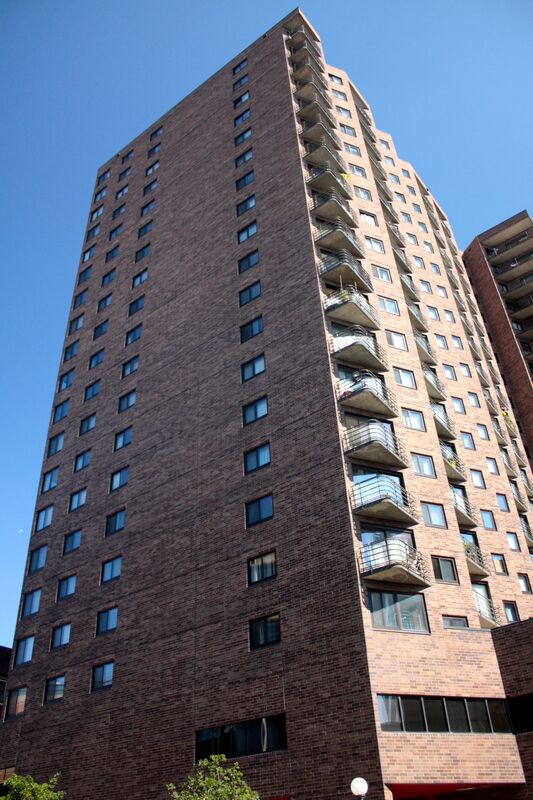 The dull but inoffensive structure has more than 190 condos as well as first-floor office space. Looking north on St. Peter Street toward the Capitol grounds. Gallery Tower is on the right behind the skyway. 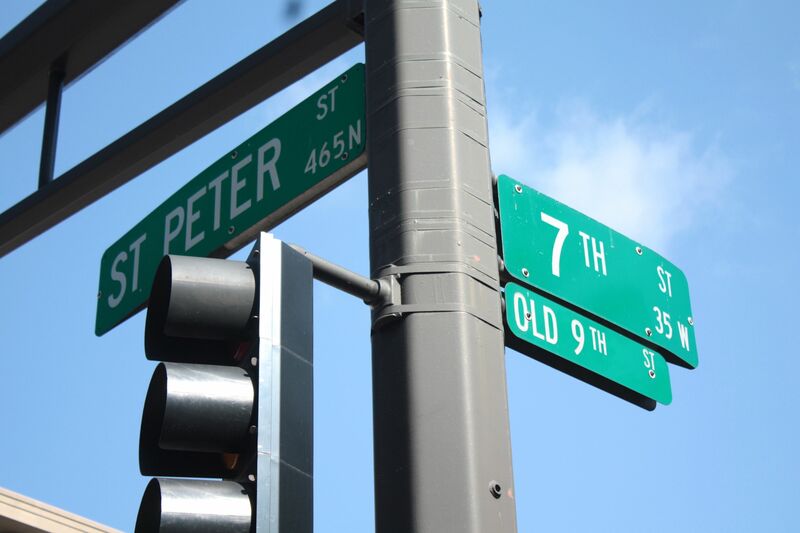 Today it’s the intersection St. Peter and West 7th Street but for many years this was 9th Street, and 7th Street was two blocks south of here, hence the small Old 9th Street sign. 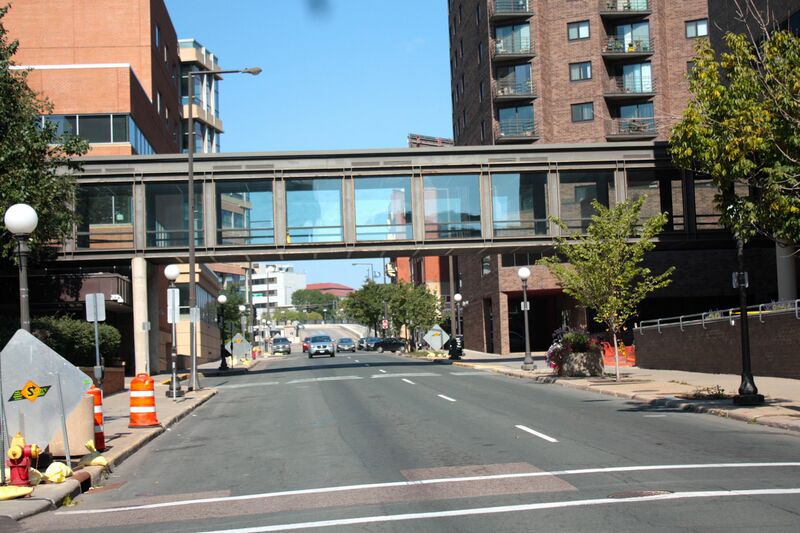 In 1956, Saint Paul’s Greyhound Bus Depot occupied the corner of St. Peter and 9th Streets. Today the depot is long gone and so is 9th street. 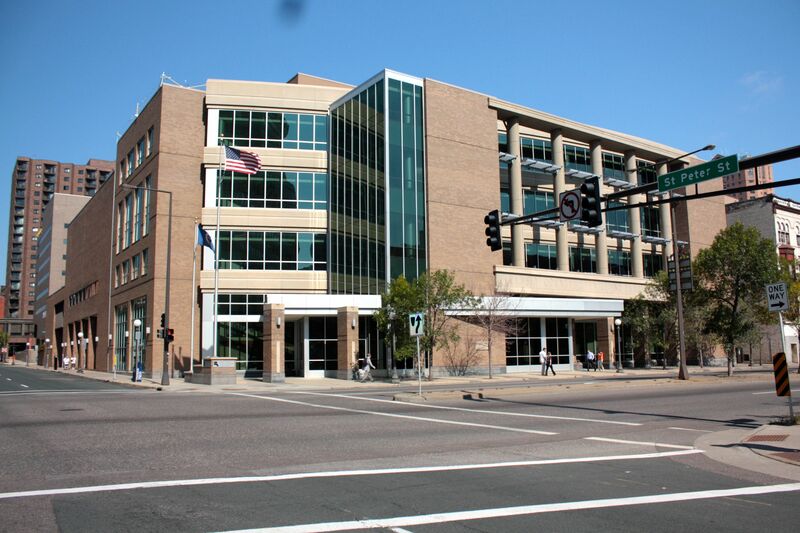 The Ramsey County Juvenile Detention Center opened in the 2000s on the same spot the Greyhound Bus depot stood: the northeast corner of St. Peter and West 7th street (a.k.a. Old 9th Street). A couple doors south of West 7th is one of Saint Paul’s most recognized but puzzling establishments. 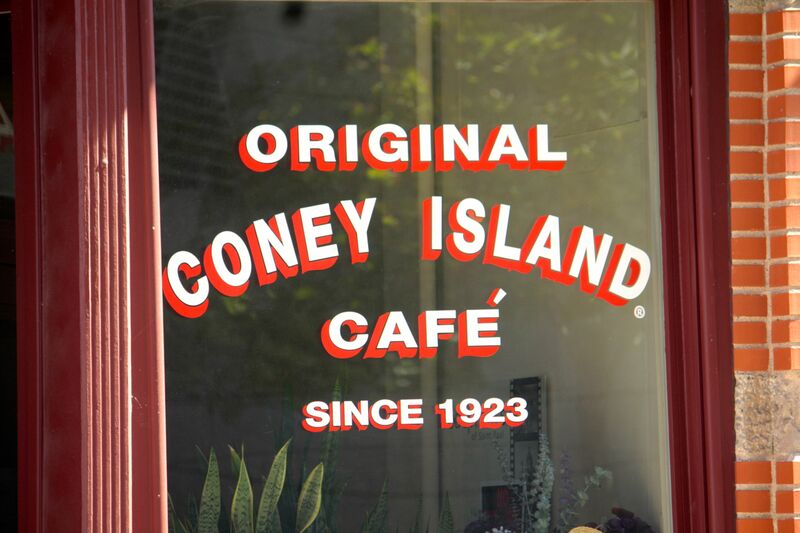 The Original Coney Island Café and Tavern at 444-448 St. Peter Street opened in 1923 and over the subsequent 90-plus years, grew into a Downtown icon. For all practical purposes, the restaurant closed in 1994 when co-founder Frances Arvanitis got sick. After her death, her three children took ownership and open the café now and again for special events. 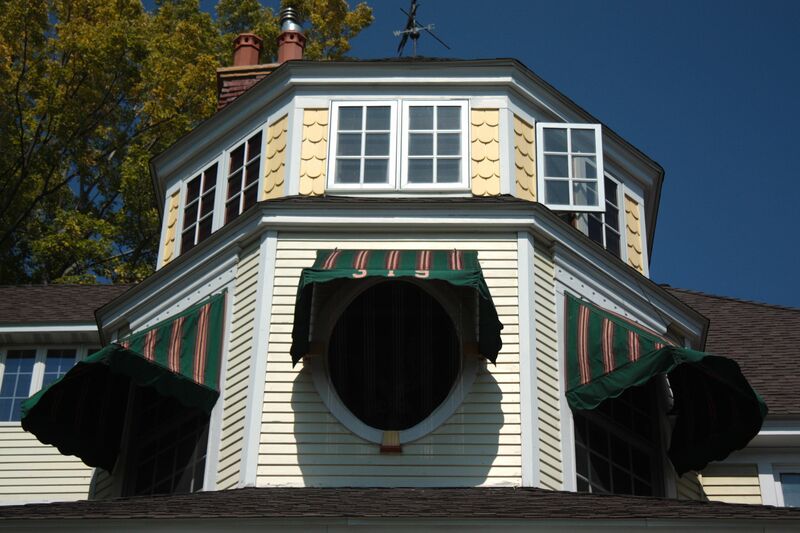 (6) The Coney Island can also be rented for private parties. The Coney Island Cafe’ and Tavern occupy two neighboring buildings. A better look at 444 St. Peter Street. 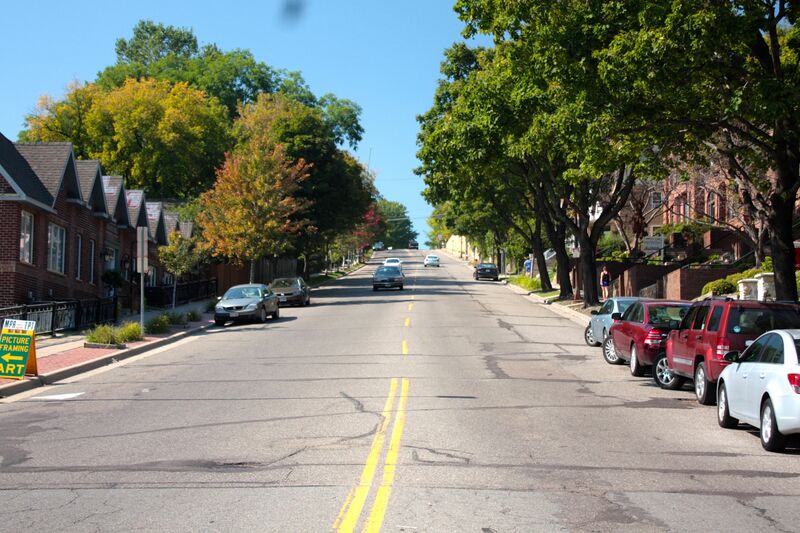 I was up for a challenge on the way home so as I left Downtown I chose to leave via Ramsey Street – one of the steepest climbs I’ve encountered in Saint Paul. I had barely begun the ascent when I stopped to snap a few pictures of the large house at 319 Ramsey. Perched over Ramsey Street like a royal overlooking her subjects, 319 is known today as the Arth House. According to my research, the Arth Law Firm is located here. A wrap-around porch on the ground floor and three-sided rooms on the second and third floors vie for the attention of passers by. 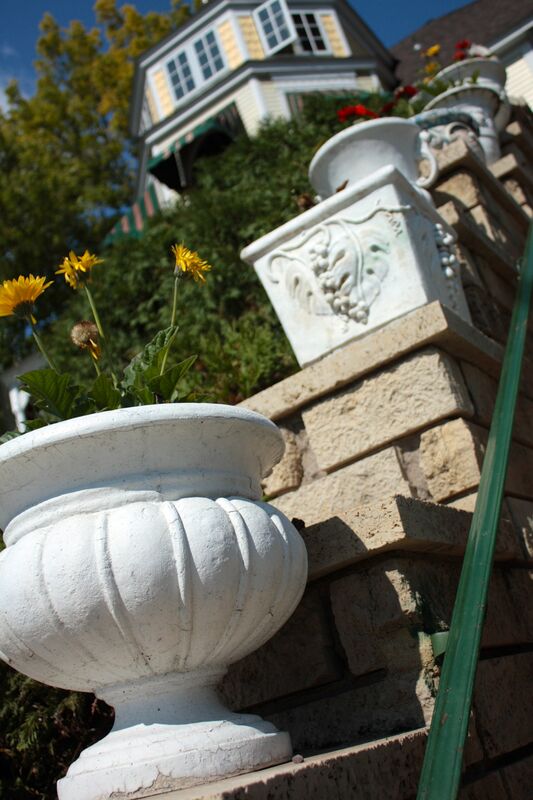 Large vases decorate both sides of the terraced stairs. Then I turned my attention back to the Ramsey Street hill. On this day, it was the hill 2, me 0, meaning I stopped twice on the way up to catch my breath. The Ramsey Hill beat me on this ride, but I’ll be ready next time. The route I took on this 13.4 mile trip is here, so please click on Garmin Connect.